Happy Holidays Ape Fans! Have we got a show for you! We are taking our customary break from reviewing an episode of the animated series, Return To The Planet Of The Apes, to talk with some special guests. On January 24, 2017, Titan Books will release the anthology book, Planet of the Apes: Tales From The Forbidden Zone based on the characters and situations from the classic era. On this episode we will be talking with co-editors and story contributors Rich Handley and Jim Beard. These high-energy guests tell us about the making of the book, what authors were chosen and which writers were interested but couldn’t fit it into their busy schedules (no spoilers but one of these writers has written science fiction/fantasy films based a long time ago in a galaxy far far away). They even hint at whether or not any of the authors had written a story based on the mystery of Urko’s helmet! We also talk with John Jackson Miller, an author who has played in many of our beloved universes from Star Wars, Star Trek and Halo. He tells us about his story and where it fits in the classic ape era and how he used TV appearances by Ape actors in his plot. He also talks about his new Star Trek and Halo books and graphic novels. 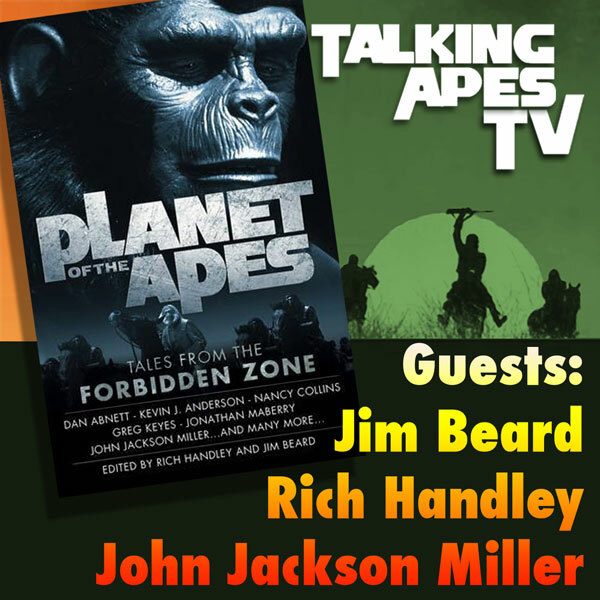 We want to thank all the Talking Apes TV listeners who posted questions for Mr. Miller on our Facebook page. He was excited to hear from you! Richard and Mark also talk about the new War For The Planet Of The Apes trailer that was just released. A great discussion for a great new film coming July 14, 2017! We hope everyone has an Urkotastic holiday season and now, GO APE!